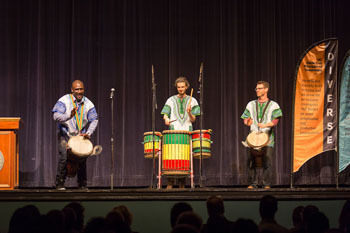 Musicians moved the convocation crowd. This year's Tony Hill Award went to Michael Watkins, the first elected African American county superintendent of schools in California, as well as a tireless advocate for students, noted for his work with young people who have special needs. 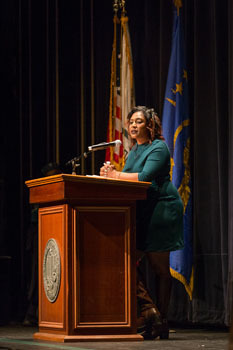 The line was wrapped around the block, and the Santa Cruz Civic Auditorium quickly filled up from the floor to the bleachers long before Alicia Garza, co-founder of Black Lives Matter, took the stage. 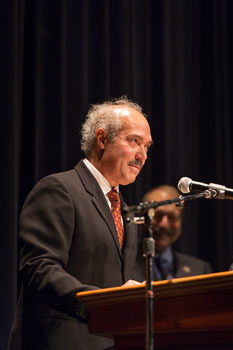 Garza, who gave the keynote address at the 32nd annual Martin Luther King Jr. Memorial Convocation on February 12, is more than just a dynamic speaker. She is also a key figure in an international civil rights movement and a charismatic leader whose remarks often left the audience rapt and quiet—with the exception of one boisterous shouter who briefly interrupted the proceedings until Garza deftly incorporated his outburst into her remarks. The shouter insisted that people are born into racism, to which Garza responded that racism is taught, and that human beings are not born with such hate. Garza put a strong emphasis on painful truths and prejudice, but she leavened her remarks every so often with her rueful and infectious laugh, which brought roars of applause from the audience. Black Lives Matter describes itself, in its website, as “a unique contribution that goes beyond (drawing attention to) extrajudicial killings of Black people by police and vigilantes … Black Lives Matter affirms the lives of Black queer and trans folks, disabled folks, black-undocumented folks, folks with records, women and all Black lives along the gender spectrum. It centers those that have been marginalized within Black liberation movements. It is a tactic to (re)build the Black liberation movement." Garza will go down in history not only as a cofounder of the movement but as the person who coined the hashtag “Black Lives Matter” in the wake of the acquittal of George Zimmerman, a white man who gunned down an unarmed black youth, Trayvon Martin. A signature sign-off turned into a movement name; Garza—along with Opal Tometi and Patrisse Cullors—began to use #BlackLivesMatter as a Twitter hashtag. The result was a grassroots activist movement that soon went nationwide. “When we heard [Zimmerman] was acquitted, it was like we had been punched in the gut … Trayvon could have been my brother,’’ Garza told USA Today in an interview. “I started writing a love note to black people (on social media. )” That note was a proclamation of love and solidarity and also a response to the “sick disease” of systemic racism. Garza elaborated on that love letter in great detail during her Santa Cruz appearance. Garza continued: “As someone who is part of a movement that gets called violent, I have a hard time when we reflect on the legacy of freedom fighters who have come before us, and we sit in this comfortable chair of nonviolence without situating it in a context: a strategy to raise the moral question of racism, meaning can’t we show that racism is an inhuman system? Can’t we demonstrate to the world that the violence exacted against black communities is inhumane, unnecessary, and eating away at the soul of this nation?" "Certainly we should be clear that we should not mistake nonviolence for passivity in the face of oppression, we should not mistake nonviolence for peace, and we should not use nonviolence as a way to ask us to be patient, to not rock the boat, to wait until change comes." “We are seeking the same goals, yet we must acknowledge that the work [of King] is unfinished,” Garza said. Another highlight of the evening was a ceremony to honor this year’s recipient of the Tony Hill Award. The award went to Michael Watkins, the first elected African American county superintendent of schools in California, as well as a tireless advocate for students, noted for his work with young people who have special needs. This special honor recognizes individuals whose lives and actions exemplify the late Tony Hill’s work and legacy. Hill, a longtime advocate for social and economic justice in Santa Cruz County, was known for his skills as a community bridge-builder and mediator. He died in 2007 at age 62. Award recipients receive $500 to donate to the charity of their choice. Melanie Stern, Tony Hill's widow and a member of the award selection committee, praised Watkins’s sincerity, hard work, and commitment. Though he has had a long and illustrious career, Watkins reflected back on the time when he was unproven and just starting out, a young man brimming with ambition and idealism. “To quote Dr. King, 'Faith is taking the first step, even when you can’t see the staircase,'” said Watkins, who was a friend and colleague of Tony Hill.